Reach local and international Blues fans effectively and immediately with an affordable ad on this website which receives approximately 32,000 unique visitors per month, and ranks high on search engines. Google “Blues Festivals” and see who comes up #1 organically! Ads start as low as $89/month. Your banner ad will run on every page (over 260 pages) on our web site and will be linked to your own web site. Animated .gifs accepted but must meet our size requirements – add additional $15 per frame per month to price. We do not accept Flash banner files. Rate: $150 per month (1 month minimum). Animated .gifs accepted but must meet our size requirements – add additional $15 per frame per month to price. Specs: Banner Ad (468w x 60h, 12k max, saved as a .gif or .jpg). We do NOT accept Flash banners. Also supply your festival name, date, venue, web address, hotline, and top 3 headliners. We will place this text below your banner. 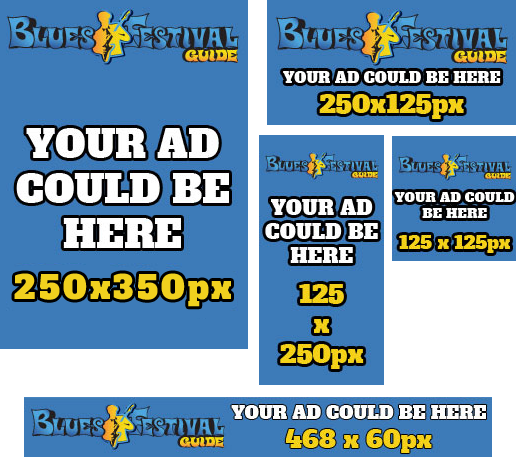 Go to www.BluesFestivalGuide.com, then click on “Submit Fest or Band/Business” on menu, fill out your listing info, and get listed and linked. There is NO Cost ! Absolutely FREE !